Everyone handles stress in different ways: running, meditating, eating a dozen donuts, screaming into a pillow, cranking up the volume on a favorite song, etc. Anxiety disorders affect approximately 40 million adults between the ages of 18 to 54, and unfortunately, it’s on the rise in America. As someone who falls into the 19% of anxiety-suffering millennials, I know how difficult it is to find a good stress coping mechanism. Most of the time, canceling plans, ignoring texts or accepting failure before trying is better than dealing with people and priorities head on. But then, the guilt burrows into my brain, contributing to the endless cycle of anxious thoughts. That’s why when I deal with my anxiety, I seek an escape from those negative thoughts. As an introvert, music is my go-to stress coping mechanism. It’s a no-pressure, natural remedy to turn off that self-loathing thought cycle. Music and sound therapy has been used through the centuries to enhance well-being and quality of life. Our brains are wired to seek comfort in patterns, which is why we tend to gravitate towards music with repetitive harmonies and melodies. When we hear a song that’s pleasurable, our brains release the feel-good chemicals, endorphins and dopamine, and lower levels of the stress hormone cortisol. Neuroscientists in the UK discovered that one song in particular reduced anxiety at a whopping rate of 65%. Dr. David Lewis-Hodgson of Mindlab International led a team of researchers to test participants’ anxiety levels while completing a series of puzzles as quickly as possible, some more stress-inducing than others. 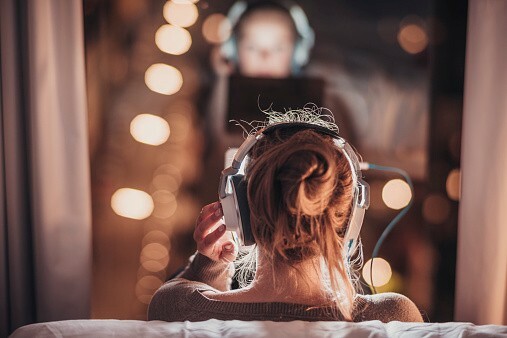 While listening to different songs, researchers measured both brain activity and physiological states including heart rate, blood pressure and rate of breathing. The song “Weightless” by Marconi Union produced a greater state of relaxation than any other music tested to date. Along with its significant anxiety reduction, there was also a 35% reduction in their normal physiological rates. Amazing. As its name implies, “Weightless” allows your mind to drift into a calm state. The repetition of ambient harmonies, rhythms and bass lines are trance-inducing. You can almost see your problems floating away, one by one. When I listen to “Weightless,” I feel like I’m floating on a fluffy cloud, wearing a bedazzled onesie, waving “boy bye” to each of my stressors. It feels great. Chronic anxiety can negatively impact not just mental health, but physical health too, leading to complications such as heart disease, obesity, depression and more. Finding an escape or coping mechanism is necessary, and music can be the greatest healing power of all. Along with “Weightless,” here are the other songs found to be most anxiety-ridding.